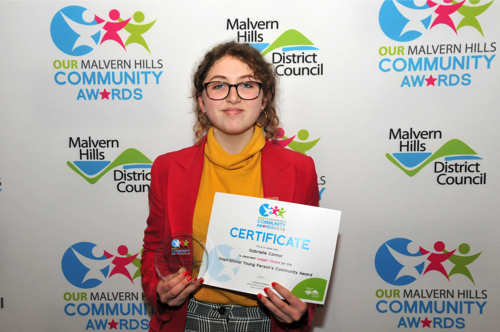 Unsung heroes from across the district were recognised at the Pride of Malvern Hills Community Awards last night (19 March). Guests packed out the HD Anywhere Stadium, the home of Malvern Town FC, to celebrate the selfless dedication of volunteers, charities and organisations who have made a positive impact on our community. The awards, which were previously named the Our Malvern Hills Community Awards, had six categories. These included: Inspirational Young Person’s Award, Cleaner and Greener Community Award, Improving Lives Award, Community Project Award, Inclusive Award and Business in the Community Award. The Community Project Award was a people’s choice award which was voted for by guests on the night. The comperes were Cllr David Chambers, Leader of the Malvern Hills District Council, and Cllr David Watkins, Portfolio Holder for Housing and Communities. Guest speakers included Chantry Community Leaders and Lucy Wells from Worcestershire Community Foundation. More than £120 was raised through a raffle which went towards the Upton charity Worcestershire Cancer Aid. Amanda Smith, Community Services Manager at Malvern Hills District Council, said: “The Pride of Malvern Hills Community Awards are a chance to celebrate the selfless, hard work of the wonderful people in our district who have gone above and beyond to help others. Visit www.malvernhills.gov.uk/communityawards, email communityservices@malvernhills.gov.uk or call 01684 862467 for more information.